CHAIRMAN, Society for Music Education, Therapy & Research PONDICHERRY,India. 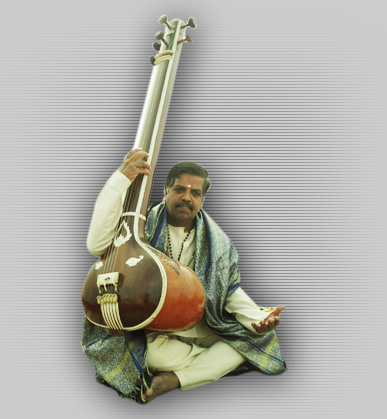 He has composed and released 24 Audio CD's and 3 DVD’s on Indian Music Therapy with Musical melodies through traditional Indian Musical instruments like Sitar, Tambura, Tabla, Veena, Violin, Flute, Santur, Mridangam, Jaltarangam etc. for Women, IT professionals, Legal Professionals, Police, Children, Heart patients, Nervous disorders, Pain Killer, Ayurveda, Yoga, Journalists, Women, 50++ age groups, Diabetes, Cancer, etc. His latest additions are the CD’s for Music Healing for PETS at home. ( Cats, Dogs, Fish and Cows) He is also a Vedic Astrologer and applies the influence of Cosmic effect for solving health problems of the people. Currently he is the Head of the College of Fine Arts and Performing Arts and Special officer for the Culture Department of the Government of Pondicherry, Pondicherry, India. He has taught at Universities in Tanjore, Mysore and Madurai in South India. He was awarded the Rajiv Gandhi Excellence Award and the State Fine Arts Academy of Kerala for the achievements in the field of Music, Musicology. He is also the Chairman of the Society for Music Education, Therapy and Research based in Pondicherry and the Indian Music Therapy Research Foundation based in Kerala. India is a land of Cultures. Indian Music has a hoary tradition and continuity for more than 5000 years . The present day bifurcation of South Indian (Carnatic) vs. North Indian (Hindustani) systems of Musical variation is quite new. In fact the South Indian System of Music has the untouched and the non-disbanded identity. The identity of the Hindustani system of music was completely changed due to the invasions by the Alien rulers, the Persians and the Mughals into the Northern part of India. The entire structure of South Indian Music was based upon Oral Tradition which is otherwise known as the "Gurukula tradition" meaning learning from the revered feet of the Guru or Teacher under his/her personal care. This tradition was in vogue till the 1940's. At this time Institutions propped up for imparting training in Music to aspiring students and both the Gurukula and Institutions stood side by side. After the 1980's the Gurukula system was sidelined and overtaken by the Institutions. Today there are not many Gurus who are integrated to the Gurukula system. WHAT IS MUSIC THERAPY ? It is a listening therapy program using specially filtered classical music to improve ear and brain function. A link is established between the sounds we hear and our functioning in speech, learning, energy and stress. The classical music that one listens transforms the improvement of the ear function and also recharges the cortex of the brain. The target group listens to the specially composed music and sounds through headphones while doing home work, playing, sleeping and through private listening, The music should be listened to at least 30 minutes a day for six to eight weeks preferably without break in the listening sessions. Today we are confronted with pollution in every sphere of life situation – be at home , school, work place, factories, office and what not. The response of the ear, brain and nervous system is to shut down in varying degrees to this onslaught Stress, strain, anxiety, depressive state of mind, restlessness all pervade our system and pulls down the existing energies. Music Therapy is non invasive, non pharmaceutical and completely safe. There are no negative side effects. Musical healing treats the cause of a listening problem by stimulating and restoring natural ear and brain function . Hearing is physical and listening is psychological. Both are vital to our communication skills, establishing good relationship, socializing with everyone and learning intuitiveness. Out of the 12 cranial nerves, 10 are linked to the ear, indicating the importance of the Musical sounds to our nervous system. .
Today people around the world are focusing their attention for curing various ailments and illness more with the help of holistic approaches and Music has become an integral method for Healing. Indian Music is used widely the world over, for healing and conserving energy in one’s body, mind and spirit. Healing with Indian Music is very popular through chanting, meditation, sacred sounds and listening to classical and traditional music in many foreign countries especially USA, Canada, Europe and Australia. I also apply the effect of Planets and cosmology on the human body and mind for effective healing with Indian Music. My Music is purely classical brought out on traditional Musical instruments which will not disturb the balance and equilibrium of your mind; And is very effective for healing ailments like Blood Pressure, Nervous disorder, Body Pain, Migraine, Rheumatics, stress, Anger, depression, Heart ailments, sleepless ness, and autism ; and for positive approaches to Marital harmony, Personality development, Medical Professionals, IT People, cancer Counseling, Weight loss, Diabetes, Stress Management, Children, Teenagers, Police Personals, Legal fraternity, Sports Persons, Senior Citizens etc. Here is an advice to you to make the best use of my Music for early and effective healing. Do Not listen (and I repeat DO NOT listen) to the music casually while you are engaged in driving, eating, working, cooking, chatting etc. You must listen to the music only in a relaxed position like lying down or sitting posture when you are alone or in privacy. It will be more effective if the music is heard with a Headphone. The sounds and tones of the music must get absorbed and aligned into your mind and body. Listen to the music for 20-30 minutes every day for at least 6 to 8 weeks before going to Bed. Do you know that Indian music is very effective for healing and improving the behavior pattern of your Pets at home? Indian Music Therapy for their Loved Pets is used as a healing method. My research studies and various experiments have shown immense result in seeing positive changes in your Loved Pets when they listen to My Music which is purely classical Indian Music brought out on traditional Musical instruments which will not disturb the balance and equilibrium of your loved pets. . My Music improve and control their behavior very positively and is meant for bringing in rejuvenation in your pets like Cats, Dogs, Fish, Cows and other Pets at home, which you love most. Here is an advice to you to make the best use of my Music for effective healing for your loved Pets. Make them listen to the music either with or without a headphone for 10-15 minutes every day at any time during the day and also again before making them sleep. The sounds and tones of the music must get absorbed and aligned into their mind and body. Repeat this for 6-8 weeks and you will see and feel for sure the real change. It will be more effective if you are not seen around when they listen to the music, so that they are not distracted with your presence while listening. Enjoy the Music and WISH YOU AN EFFECTIVE AND EARLY RELIEF FROM YOUR HEALTH PROBLEMS.